Blueberry Flax Granola. I used to be a huge cereal fan. When I went to a whole foods way of life, I ditched the cereal for homemade granola. I have many homemade granola recipes on my blog, now I can add this blueberry flax vegan granola recipe to the list. If you have never made granola, this is a great recipe to start with. It only has 7 simple ingredients. If you don’t care for blueberries, you can use any dried fruit you like in it’s place. As an added bonus, your house will smell amazing as it cooks. You can enjoy this granola several ways. Eat it with milk like you would cereal, grab a handful as a snack, or sprinkle over yogurt or chia pudding. This granola is also nut free so it’s perfect for school lunchboxes! Looking for more granola recipes? Say goodbye to boxed cereal forever! In a large bowl , mix all the dry ingredients. Slowly stir in the maple syrup and mix until everything looks well coated. Bake for 15 minutes, remove and shake around. Place back in the oven for another 10-15 minutes. This can be kept in the pantry for 2 weeks. You can also freeze it for longer storage. Enjoy! Mmmm this looks delicious! I've never been a huge cereal person, but sometimes I crave that crunch in the morning! This is a fantastic recipe! There's nothing like granola, prefer it over any cereal. Thanks for sharing. Sounds delicious!! I am going out of town soon so this will be perfect to take on the road with me. Thanks Mary! I hope you enjoy it. All flax meal is is flax seeds ground, so if you have a coffee grinder or something else to grind small food items, it is really easy to do. I can't wait to try this! I love how its nut free (makes a nice change from most granola recipes). I LOVE blueberries - but I'm not a big fan of them dried. They are always so sweet to me that I can't taste any 'blueberry' at all! I think I might do this with golden raisins... I have a open packet all waiting to be used up! I just love your recipes but I cannot eat seeds because of diverticulitis. 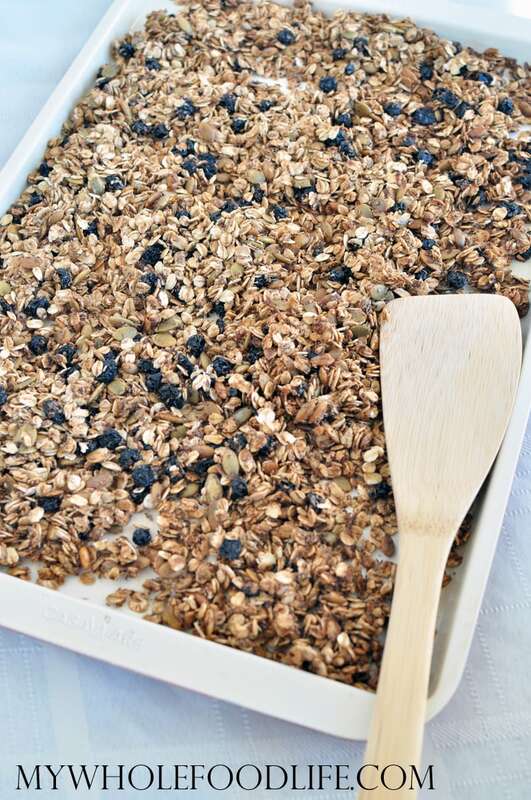 What can I do instead when making granola?